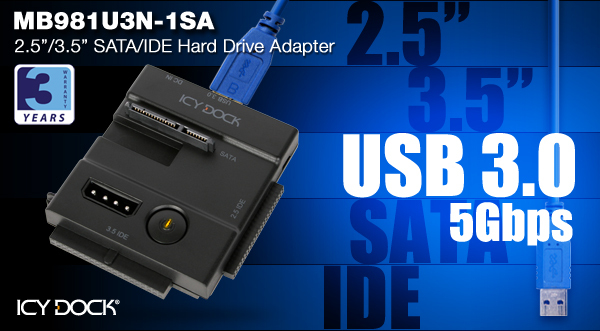 Icy Dock is proud to introduce the MB981U3N-1SA USB 3.0 2.5” / 3.5” SATA & IDE Hard Drive Adapter. This adapter is an ultra portable yet space saving solution for users who require high transfer speed with multiple hard drives to swap, whether it is IDE / SATA or a 2.5” / 3.5” form factor. The MB981U3N-1SA accepts almost all kinds of drives including ATA (IDE), SATA, 2.5”, 3.5” hard drives and SSDs. It allows universal adaptability with modern PCs or Macs via SuperSpeed USB 3.0. With a theoretical maximum of 5Gb/s, you get the lightning fast transfer performance you need to finish your tasks fast. With USB 3.0 capable of backwards compatibility, the adapter can be used in older systems that only have USB 2.0. This is the best interface to date with reliable compatibility for many different systems. The minimalistic design of theMB981U3N-1SA allows for a significant space reduction, leaving a small footprint when using the device in several positions for your SATA hard drive can be used in. With this ability, accommodating to different surfaces makes it easy to use almost anywhere. The SATA & IDE ports are also built to fully secure your inserted hard drive and help prevents data loss or damage to your hard drive connectors. Lastly, the exposed hard drive allows full passive heat dissipation to optimize cooling and performance. Strategically placed ports and the screw-less / tool-less design make using the MB981U3N-1SA quick to swap multiple hard drives in seconds for everyday use. An individual power button which doubles as a status LED is also included to allow users to increase drive life and conserves electricity when not in use. 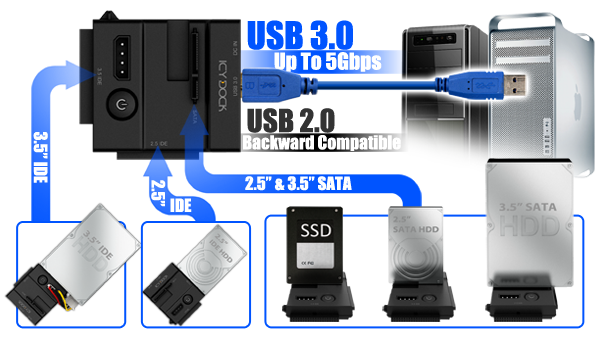 Whether it is 2.5”/3.5” or IDE/SATA HDD, each type of hard drive is compatible and can be accessed in three easy steps – insert the hard drive, plug in necessary cables, and press the power button. Also, most 2.5” hard drives or SSDs can be power by a single USB connection. Meanwhile, a slim power adapter is included for 3.5” SATA hard drive, and a 4-pin power jumper cable for 3.5” IDE hard drive to ensure enough power is provided. * Connects 2.5”/3.5” ATA (IDE) & SATA Hard Drive & SSD. * Secured port connectors to prevent data loss or damage to hard drives. * Able to run 2.5"/3.5" ATA (IDE) & SATA hard drive simultaneously. * Included convenient 4-pin power jumper cabled provided for use with 3.5” IDE drive. * Low profile power adapter for 3.5” drives. * USB bus power for 2.5” drives.